OK, let's see if I remember this part of Italian progressive rock history... The band New Trolls, who started in the late 60s, split into two groups several years later. This gave birth to New Trolls Atomic System and a band who took a little while to name themselves but did an album as Nico Gianni Frank Maurizio, who then changed their name to Ibis and released two albums, of which Sun Supreme was the first. Unlike the many Italian symphonic progressives who were essentially operating under the Moody Blues / King Crimson / PFM or Banco lineage, the New Trolls never really had a consistent style; they started out beat / pop, obviously caught a huge Led Zeppelin influence, did a very folky double album and then at about the time they split, both factions finally went in a pretty solid progressive rock direction, if perhaps still taking the lion's share of their influences from the UK (Ibis took drummer Rik Parnell as well). To my ears, Sun Supreme is the best of the lot: it is composed of two side long tracks that have a decidedly spiritual bent and is nearly drowning in the big keyboards the era is known for. It's huge, grandiose, and epic, and in some ways is a bit modeled on Yes' Tales from Topographic Oceans, especially in that it could be argued the second suite on Sun Supreme was stretched out a bit with some drum soloing to fill out the space requirements. But I tend to give some of that a pass as I really go for the kind of space-symphonic merging going on here. There's lots of cool twists and turns, from Zeppelin-esque rock to quasi-orchestral moments and lyrics in English dominated by Eastern spiritual themes. Progressive rock is often prized for its virtuosity but I tend to think it mostly works because of a balance of ambition and naïveté in an era where post-modernism wasn't a thing yet, and in that sense there's really no better example of this than Sun Supreme. The New Trolls Family tree is a convoluted structure – if you piece it together, it includes most of the well known Italian rock groups of the 70s whether closely or barely related. Ibis was the second half of the New Trolls split in the early 70s. One "half" continued as the New Trolls Atomic System, the other transmuted to Nico Gianni Frank Maurizio, a name later shortened to Ibis. 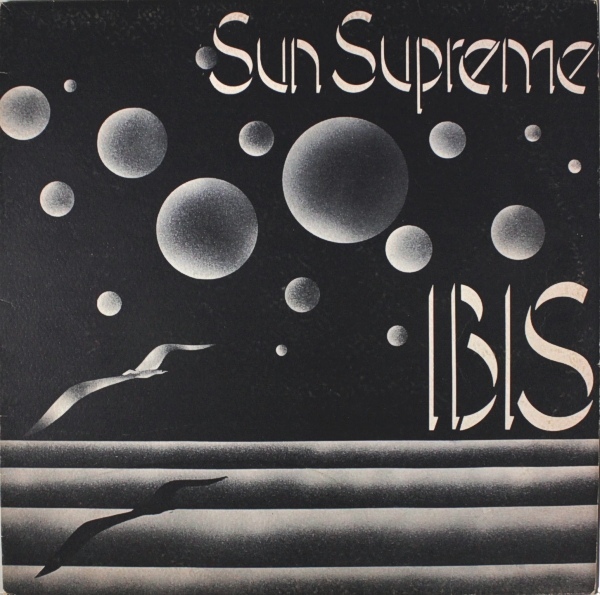 Sun Supreme is Ibis' debut with Atomic Rooster drummer Rick Parnell filling in, and is probably the best of all the closely related Troll groups. Sun Supreme, as good as it is, is also most derivative, there are strong hints of Led Zeppelin and Yes throughout (plagiarism comes to mind here), with the vocal harmonies and the occasional similar riff. The songs are two side long suites with titles and part titles that give new meaning to the word pretentious. The music is classic Italian progressive with great dynamics, lots of warm synthesizers and chunky organ, great guitar work, and some compelling upbeat jamming parts. Musically it's quite solid, all fans of Italian progressive should like this one, it's one of the best 10 or 15 in this genre.